We love our downtown and we want you to love it too. Whether you’re visiting on a vacation, here for a conference or cultural event, or taking advantage of our fabulous shopping, you’ll soon discover that downtown Langley City has a one-of-a-kind ambience that will entice you and tempt you to stay longer. Our events and initiatives are designed to provide free and fun outings for you and your family. From our not to be missed Arts Alive Festival, to our shopping promotions and foodie events, everything is planned with our local community and welcomed visitors in mind. We want you to get to know our downtown like we do and we strive to ensure you enjoy all we have to offer. 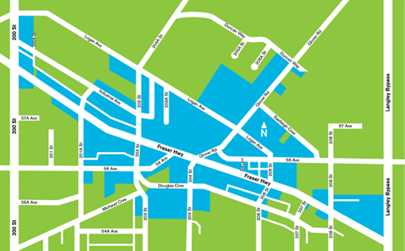 Strategically located in the heart of the Fraser Valley, downtown Langley is an easy drive from anywhere in the lower mainland. People visit us for our friendly customer service. People discover us because of our over 500 unique shops and services. People work here because of our strategic geographic location, our knowledge-based initiatives, and the many successful businesses that are launched here. People live here for the values we portray: respect for the environment, the promotion of healthy lifestyles, an appreciation of our cultural community, and the importance of a thriving family life. To get to Langley City by Bus from anywhere in the Lower Mainland, click here.